Could you recommend a way to make a backup of these recovery partitions I'm to delete? Oops, the dell-recovery package itself gives me an option to do this. I don't know what an EFI partition is, though. In the meanwhile, let me uninstall the dell-recovery package and try booting the live USB, then report back. the dell-recovery package itself gives me an option to do this. I don't know what an EFI partition is, though. It will be a small partition formatted as FAT32 .. and likely listed in GParted as "EFI System Partition", and mounted at "/boot/efi"
Yes, the recovery tool worked and I now have a recovery iso. On the other hand, uninstalling the dell-recovery package does not solve the problem. I'm puzzled by that particular error message I get (about the recovery option being only for Dell systems that came with Ubuntu pre-installed). Mine is exactly that, so I shouldn't get the error; makes me think of potential problems if I ever need to use that recovery USB. I'm also curious about why the problems I described occur with the Peppermint live USB and not a Xubuntu live USB. If anyone's had a similar experience, please do share. Perhaps it would be prudent for me to hear how it went for you before formatting the entire HDD on a brand new computer! If so, what happens if you change from "UEFI to "Legacy" .. Apply, and Exit. 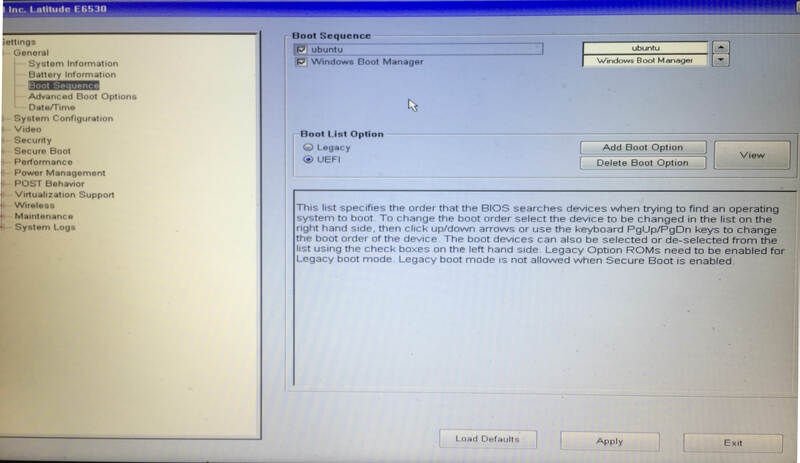 Can you now boot from the LiveUSB ? You can always switch back to UEFI .. Apply, and Exit. Which version of Xubuntu worked ? Yes, this is what my BIOS looks like. I've already tried the Legacy option; with the Peppermint live USB I still end up in an Ubuntu live session or get the same recovery error if I try to install. Xubuntu 16.04 is the version I tried. I didn't try installing but the live session works correctly. Hi N, are you using the same USB memory to boot or do you have separate memories? I ran into this same problem with a memory stick I was using and ended up using it only for music storage. I'm afraid I don't understand your question. What do you mean by separate memories? How easy is it to (temporarily) remove the HDD on this model ? I'm pretty sure you'd have no problem if the Dell recovery partition wasn't confusing the bootloader. It'd be interesting to see if the LiveUSB boots perfectly with the HDD disconnected ? Hi, removing the HDD is beyond my knowledge/ ability. Well I don't know what to tell you then my mate .. I'm **fairly** confident that wiping the drive (or deleting the ubuntu EFI boot loader and recovery partition) would do the trick .. BUT .. There's no way I can advise you to do this because there's no 100% guarantee .. it would need to be your decision. b) Risk wiping the drive and installing Peppermint without first cloning, this will **probably** work, but if not you'll have lost the recovery option. d) Give up and install something else. I tend not to give irreversible advice that **may** result in a non-working system, without the user being FULLY aware of the risks first. Theoretically you could back up just the recovery partition, then delete it, and then backup the EFI bootloader(s) then delete it/them .. but again there are risks, so the decision has to be yours. Thanks, I appreciate the detailed and honest advice here. I've been getting on with work on Ubuntu, and I'll wait for Peppermint 9 or give Xubuntu 18.04 a try in case that works. It seems like the least amount of headache and risk. Hi N, sorry about the confusion. I am wondering if you are using the same memory stick to boot up the various systems or do you have different memory sticks for each system? I had about three or four different sticks that I would change Systems on as I was checking out different ubuntu flavours. Eventually, one of the sticks just stopped booting even with a system installed in it that had previously worked. Eventually, that stick wouldn't even mount. So that's why I was wondering if the memory stick you are trying to boot with Peppermint works with Ubuntu or whatever else you are using? I tied using multiboot but many systems either wouldn't boot at all or wouldn't install from the live session. Does that make more sense? PCNetSpec, yes, it's the most sensible option for me at the moment. I don't enjoy working on Ubuntu (I do on Peppermint), but as a layperson I'd much rather just ignore the annoying bits for now and do stuff than spend any more hours fiddling with the BIOS and the hardware. Particularly because I don't know what I'm doing and could really break things!